Agreement with the Army General Staff. The Dimonios wore the American uniforms of the 40s and starred in the TV series "Catch 22"
directed by the first marshal Lieutenant Andrea Atzeni, they are improvised actors. George Clooney in Sardegna. "Va pazzo per tartare di tonno e vino rosso"
George Clooney in Sardegna, parla la ristoratrice: "Va pazzo per la tartare di tonno"
"Clooney ha gusti semplici, adora la pasta al pomodoro, alterna la spigola al sale con sushi e sashimi, ma il suo piatto preferito è la tartare di tonno", confida al settimanale OGGI, da domani in edicola, Enza Bernardo, titolare del ristorante Al Marino di Puntaldia, in Sardegna. Qui Clooney ha affittato una villa per ospitare Amal e i loro gemelli (e OGGI pubblica le foto del loro arrivo sull'isola), mentre è sul set della serie tv "Comma 22". Continua la ristoratrice: "Sul vino sa quel che vuole. Può cominciare con un prosecco, ma poi passa al rosso. Di solito beve Le Difese, un vino toscano, ma apprezza anche vini sardi come Cannonau e Carignano. A fine cena, quando mi avvicino col vassoio di dolcetti fatti da noi, lui mi guarda e mi dice: 'Tu sei il diavolo'". Tanned like Amazons by the time they get to work ! We're having a heat wave here in UK ! George Clooney in Sardinia. "Go crazy for tuna and red wine tartare"
George Clooney in Sardinia, the restaurateur speaks: "Go crazy for the tuna tartare"
"Clooney has simple tastes, he loves pasta with tomato sauce, he alternates sea bass with sushi and sashimi, but his favorite dish is tuna tartare", confided to the weekly OGGI, from tomorrow on newsstands, Enza Bernardo, owner of the restaurant Al Marino of Puntaldia, in Sardinia. 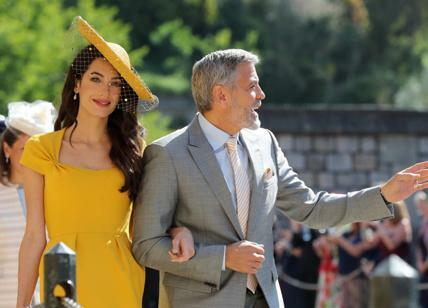 Here Clooney has rented a villa to accommodate Amal and their twins (and TODAY publishes photos of their arrival on the island), while on the set of the TV series "Comma 22". The restaurateur goes on: "He knows what he wants on wine, he can start with a prosecco, but then he goes to red, usually he drinks Le Difese, a Tuscan wine, but he also likes Sardinian wines like Cannonau and Carignano. approached with the tray of sweets made by us, he looks at me and tells me: 'You are the devil' ". But who would have thought that a Hollywood star, above all the film's director, would have shoveled excrement of goats deposited by these irreverent extras on the set in the province of Olbia. And instead George Clooney, behind the camera for "Catch 22", a film set in the second world war and entirely set in Gallura, has rolled up his sleeves and started this "dirty work" without asking anyone for help. These are the anecdotes that filter almost daily from the headquarters of the disused Venafiorita airport, just outside Olbia, and which strike the curiosity and imagination of many. Yesterday was the newspaper La Stampa of Turin to report the history of the goats and the hard cleaning of the set by the former pediatrician of ER. To tell the facts was Edoardo Martino, thirty-seven Roman, who with his company Zoo Grunwald supplies of animals of any kind film sets, fiction, TV programs, theater and advertising. Martino's family has been doing this strange job for over fifty years and there is no request that it should not be satisfied. From the legendary little bird of Del Piero to the camel of Fiorello, from the dog of the commissioner Rocca to the donkeys of "A un passo dal cielo" are all animals supplied by Martino, just ask and he provides. As for "Catch 22" the enterprising entrepreneur presented himself on the set with fifty goats, as had been requested, to create a very complex scene. And the drawback, perhaps among the most classic with the animals on stage, has been quite evident after a short time that the goats were circulating among the cameras. Dung balls scattered almost everywhere that the American actor has taken steps to remove himself with a shovel. No problem therefore, fact that confirms the simplicity of this star that in Sardinia has already become known to be a person in hand who does not refuse, indeed the opposite, contact with the locals. I was having to manage a room full of cages with canaries, I was an intrusive presence in short, and I remember having received some dirty looks ... ». George, on the other hand, is different, and so he has not decomposed for the incontinence of sheep and indeed he has armed himself with a shovel and a lot of patience. Happy to hear George has not decomposed - for the incontinence of sheep or for any other reason!